The web browser is our doorway into the online world, but as of late, that doorway seems to be getting bigger and more things are constantly trying to get in. Don’t get me wrong, I love the age of information and I try to drink as much as I can from that fire hose we call the Internet, but that’s exactly what it is; a huge, unstoppable flow of information and it will drive us insane if we let it. The RSS feeds, constant emails, bookmarks, Tweets, PMs, IMs, Pings, eCards, and I could go on and on. All of this is essentially information that we have to wade through and even if we want, we couldn’t possible soak it all in so we have to choose the best of the best and devour just that. As part of my attempt at cleaning house for the new year, I am stopping any stream of information into my digital life that is not completely awesome – completely the best content I can get my hands on, because you know what? There isn’t enough time to waste on mediocrity. Email is my first stop. I have tons of email newsletters that at one time were relevant to my life but many of them haven’t even been read in ages. I just delete them as soon as they come in and the time it takes to do that, while seemingly small, adds up. To prune the unnecessary, track your email newsletters for one week. Make a note of every email newsletter you delete without opening, or that you open and get little information from. Consider that week a probationary period for these bits of digital information and at the end of that week, unsubscribe from the newsletters that aren’t adding value to your life any longer. RSS feed subscriptions are very similar to email. Sometimes you subscribe to something because it’s great stuff but too often, quality drops and you no longer even open the feed. Instead of ignoring it forever because that takes some amount mental energy, take a tiny bit more time and unsubscribe from the feeds you no longer read. Tip: I worried that if I deleted feeds with articles I had Starred for later, the Starred articles would be removed from my Star folder as well but with Google Reader, that is not the case. If you unsubscribe from a feed, any changes you made to posts in that feed stay with your account. SocMed is awesome. It’s a whole new way for us to get instant access to all the information we need and even more that we don’t. I enjoy spending time with my online buddies and all, but anything will take over your life if you let it, including Twitter and Facebook. Instead of jumping onto your favorite Social Media network willy-nilly, schedule a time that you will use Social Media. You may miss things here or there, but honestly, with a smaller window of time to use Social Media I am able to focus more on the great things and filter out more of the noise when I’m there. Plus, I don’t find myself five hours later wondering what the heck I have been doing the whole day! If you’re worried about missing something important on your Social Media network, check out Feedera which can send you a daily digest of your Twitter activity. Browsers get cluttered like anything else we use with bookmarks, caches and history. I’m kind of a bookmark junkie myself and bookmark everything, but how can that be useful you ask? With Firefox as my browser of choice, its “awesome bar” (what they call the address bar, because of its added functionality in FF3) can actually instantly search through all of your bookmarks when you type something so my bookmarks are used quite often now. If you know any word that is in the bookmark title, or URL, the awesome bar can pull that out and show your bookmark as an instant result. This helps to alleviate having to wade through thousands of bookmarks for that one site you found and bookmarked back in 1999. I’m also a tab junkie and have at least 30 tabs open at all times. The newest version of Firefox (still in beta) will actually search through open tabs as well when you use the awesome bar so you don’t open a tab more than once but I plan to close more tabs than I open this year. To do that, I am using an application called Rainlendar and instead of leaving a tab open to remind me of something, I just copy the URL into an event in Rainlendar and there I can actually give it a date to remind me to look at the website again and follow-through with whatever idea I had for that tab. There are many other ways to set reminders for yourself but I really like the way Rainlendar handles todo’s and events; not too obtrusive, but enough that I won’t miss events and reminders. If the clutter is simply too much in your current browser, try switching browsers for a while. 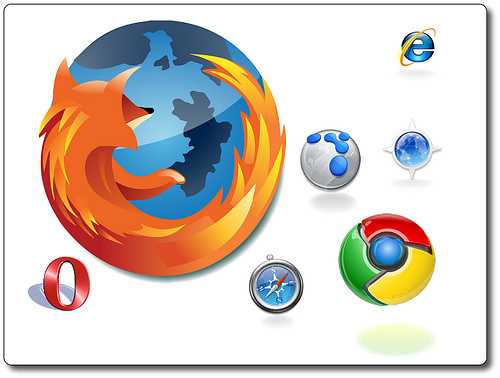 You may find you are much more efficient in the new browser, or you may regain your original love for your old browser. Either way, this is a nice way to get a fresh perspective on things. That’s it for my series on cleaning house. Life is a mess and we really just have to make the best of things as we go along, but there are certainly ways we can make the process a little easier on ourselves. I hope these tips were helpful and if you have any of your own, drop them in the comments below! Thank you for the information. I do not like to take on large projects, so I break them into smaller tasks. This way, I accomplish more things. That’s how ya have to do it! Deleting email is something I seem to do only once a year… but when I have an empty inbox (for just a few minutes), its the best feeling ever. I love the premise of this post. I’m going to steal it for my own life. Too much junk gets in and the diamonds just get lost. Thank you for an inspiring article. Interesting tips. I hadn’t heard of those two: Feedera and Rainlendar. Might have to check those out. Really, it’s all about making things efficient so that the important things get done and more free time is available. If you have any more such tips, keep ’em coming! Will do Ray, working in the IT field, I do discover quite the collection of great tools, it’s just I encounter the same problem that I discussed here; overload! 🙂 It’s hard to sort through and figure out which ones are useful and which are just fluff.